György Ligeti’s set of piano studies, composed between 1985 and 2001, is one of the most remarkable works for the piano written in recent years. He originally intended to write twelve, and published the first book with the first six. He enjoyed writing them so much that the second book contains eight and he projected a third book of which he only completed four. They are ferociously difficult: a glance at the printed score will make any ordinary pianist blench and stare. That said, such is their quality that many pianists have learned them and there are at least a dozen recordings. In short, they are already classics. 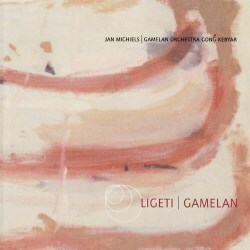 Ligeti used a great variety of techniques in them. As well as drawing on the piano studies of Liszt, Chopin and Debussy, and on more recent works, such as those of Bartόk and the player-piano studies of Conlon Nancarrow, he also drew on music outside the European tradition, including that of the Central African Republic and Balinese gamelan. The most obvious sign of these influences in his studies is his use of polyrhythms, not in the sense of playing five notes against four or the like, which were much used by Scriabin, but rather in the sense of different rhythms superimposed. Nearly all the studies are fast, sometimes very fast, and the different rhythms are superimposed on an already rapid movement. For this reason there is often no obvious basic pulse and the time signatures in the score are simply there to help orientate the player. Ligeti uses the whole compass of the piano, with more passages in the extreme treble and bass than other composers. Despite all these complexities the studies are exuberant, even joyful at times, and in mastering the technical difficulties the pianist must also retain a sense of fun. Incidentally, Ligeti was only a mediocre pianist and could not play them himself. The idea behind these two discs is to set Ligeti’s studies beside two of his non-European influences: music from the Banda Linda tribe of the Central African Republic, performed by the ensemble Ongo Trogodé, and gamelan music from Bali played by Gong Kebyar. These two traditions are completely different from those of European art music. It took me some time to get orientated, and I needed the help of Ottό Károlyi’s Traditional African and Oriental Music (Penguin, 1998), which I can recommend. I should set out a few of these differences. Although there is a class of professional instrumentalists, there is often no separation between performers and audience. Music is often closely associated with social or religious occasions and may also involve dance. There is no system of notation so improvisation and oral tradition occupy a far larger place than they do in European art music. There is often no separation of composer and performer. There is also often no exact equivalent to the European musical work, with its clear beginning and end and defined content. A musical performance may go on for hours and will respond to the reactions of the audience. It is a completely different aesthetic from that of European music. 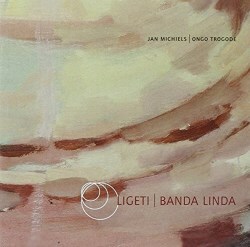 The first disc includes the first book of Ligeti’s studies and twelve performances by Ongo Trogodé. Any pianist who can tackle these studies gets my admiration and Jan Michiels can certainly play them, though the main interest here has to be the African works. These are mostly played on an ensemble of wooden trumpets which include low as well as high pitched instruments, though one is a choral work. I have to admit that I could not make much of them. Each one sets up a pattern of playing but with the absence of development in the European sense – and which Ligeti provides in his pieces – even though they are quite short, they seemed long and I soon tired of them. This is of course a reflection of my ignorance of the idiom rather than a criticism of the performances. I can just about see how Ligeti was inspired by the complicated rhythms in writing some of his studies, but I am afraid that to me they seemed no more than raw material. I found the gamelan works on the second disc easier to get on with, but then this tradition has had a longer influence on European music, including Debussy, Britten and Messiaen. The instruments used are very attractive, with gongs, bells, metal hammered instruments and drums. The performances also seem more like pieces than the African ones. On this disc they are interspersed with the second book of studies. One might expect a third disc, including the four studies of the third book, but no such disc has been issued. Jan Michiels plays with gusto. He even plays the first version of Etude 14, now numbered 14a in the score, which Ligeti was told was unplayable by a human pianist. He does, however, play it well below the marked speed. Given the difficulty of the pieces, this is a considerable achievement, though I can imagine subtler performances, with more light and shade. I have no quarrel with the recordings, which were made over several dates in Belgium. The sleeve-notes, by Jan Michiels himself, are skimpy in the extreme, telling you practically nothing about the African and Balinese works, which are the point of these discs. There is an error on the back-cover of the first disc, which omits the sixth study and so gives incorrect numbers for all the following African works. I cannot comment on the playing of the African and Balinese works. This was an interesting idea which has not quite come off. If you want to explore Ligeti’s studies, Pierre-Laurent Aimard, who was Ligeti’s favourite pianist, played the first fifteen – all that were then composed – on one of the discs in Sony’s incomplete Ligeti edition (SK 62308). He later added the last three on a disc for Teldec, which took over the project from Sony though this disc is not part of that series, bulking out a few of the earlier studies, with two pieces by Steve Reich and his own choice of African music. I wish that one or other company would arrange to issue a single disc with a complete set of Aimard’s performances of the studies as these are the benchmark. There are several other recordings; I can recommend Thomas Hell who gets them all on one disc (Wergo 6763 2) and who brings out a different side of these brilliant pieces from Aimard. Had Jan Michiels recorded the four of the third book and put the whole set onto one disc, this would also have been a serious contender.